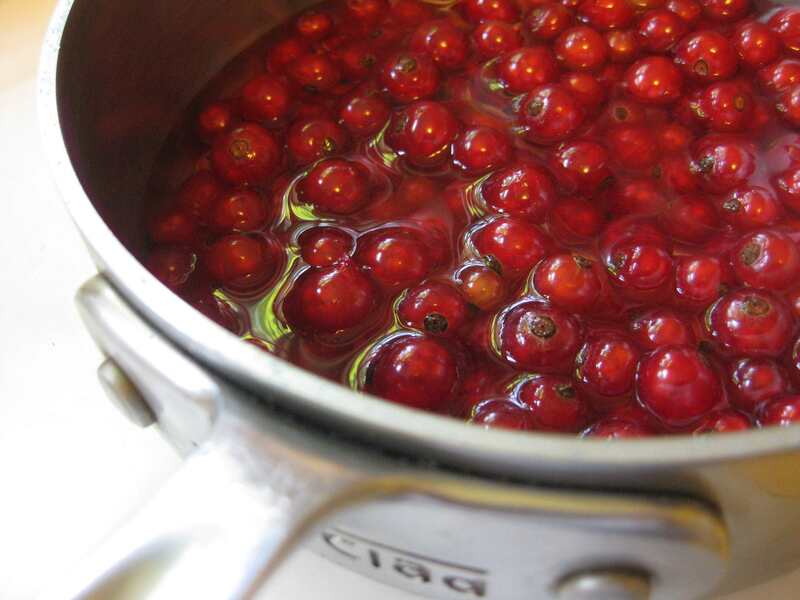 Red currants work magic with other seasonal fruit in the preserving pan. Those tiny translucent red orbs impart a rosy hue and tart flavor to their companion fruit. And they add natural pectin that gels the fruit into jam and preserves without overcooking. Not to mention their nutritional value. Seasonally, red currants overlap strawberries waning in late June and apricots emerging in July. And since they’re sold locally only in tiny amounts, I use them as additives to other dishes. Someday, I’ll get my own bush. Meanwhile, I was really fortunate to obtain a second week’s worth of fresh local apricots. While these were from the same tree, they weren’t the same variety according to the farmer, since they were propagated by grafting. 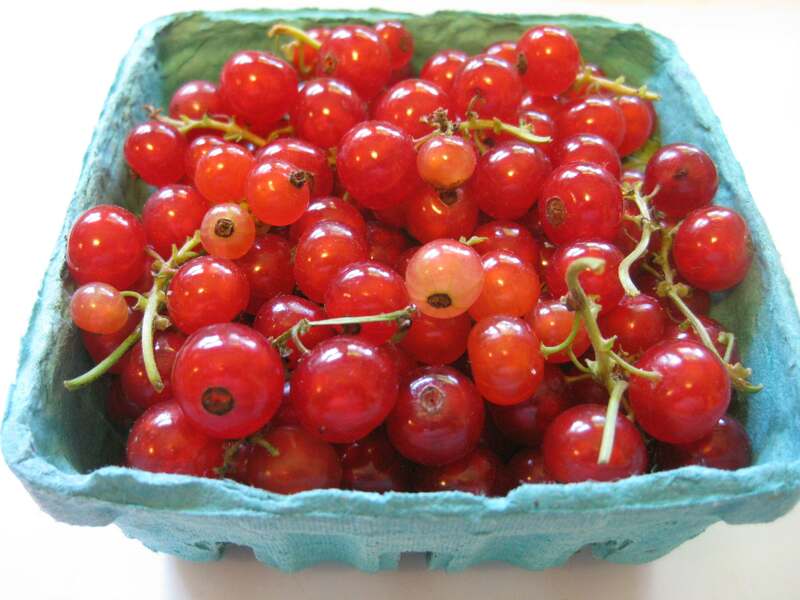 They were smaller, rosier, and firmer than the previous week’s haul, so instead of reducing them to a puree, I decided to leave the quarters whole, suspending them in clear rosy jelly aided by the addition of the red currants. 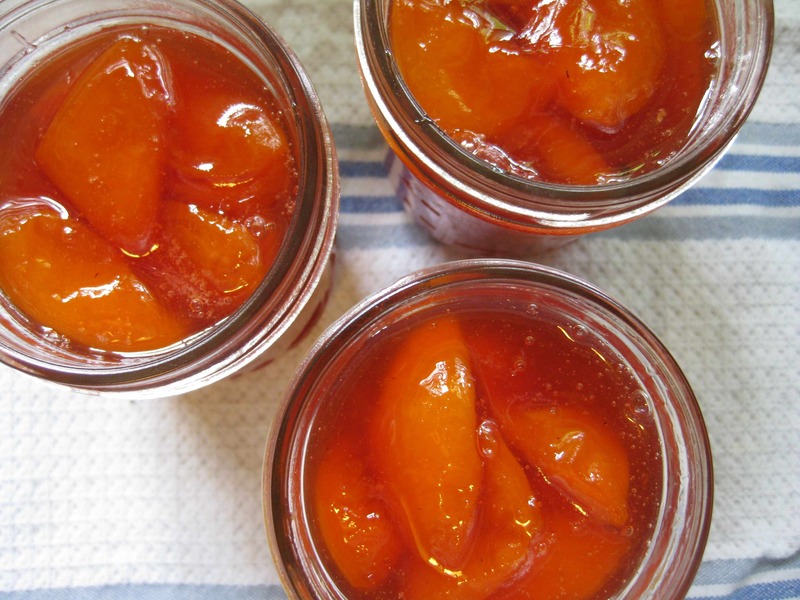 The technique is the same as for the apricot-vanilla jam that I recently made, up to the point of final cooking. Instead of boiling the fruit in its liquid, I drained the liquid into a wide saucepan and cooked it to a gel, then added the quartered apricots and cooked them for a short time, again until tested for gel. This is another classic technique from Christine Ferber and here it produced a jewel-like preserve with a stunning red-orange color. Rinse and dry the apricots. Quarter them lengthwise, removing the pits. (You can crack open the pits to reveal a flavorful kernel that you can use for another purpose, or discard them.) Combine the apricots, sugar and ½ cup of water in a bowl, stir well, and let the apricots macerate for an hour, stirring occasionally to make sure that the sugar is dissolving. Meanwhile, remove the currants from their stems and place in a small saucepan with 1 cup of water and bring to a boil, cooking until the currants pop, about 3-4 minutes. Remove the pan from the heat and set aside to cool for about an hour, or until the end of the time when the apricots are macerating. Push the currants and their liquid through a sieve set over a large saucepan, to remove the seeds, pressing down to eke out the precious liquid. Add the apricots and their liquid to the saucepan containing the currants and bring the mixtures just to a bare simmer and pour the mixture back into the apricot bowl. Let cool, cover with crinkled parchment paper and refrigerate overnight. When ready to make the preserves, prepare the canner, jars and lids if you’re going to process them via water bath. Place a saucer into the freezer for testing the gel. Add the reserved apricot quarters to the saucepan, stir well, and boil for 4-5 minutes until the liquid once again passes the gel test. Ladle into hot prepared jars and cap them. Process in a water bath for 10 minutes after the water returns to a boil. Turn off the heat, remove the canner lid and let sit for 5 minutes before moving them to sit on a counter, undisturbed, until cool.